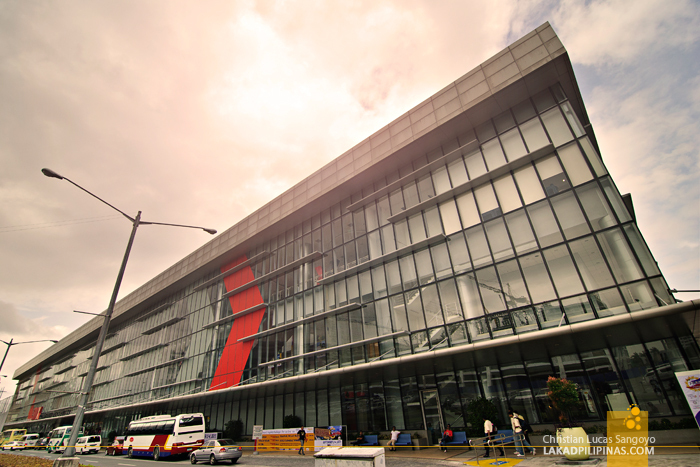 It was fifteen minutes past ten and we were running late for this year’s much anticipated Philippine Travel Mart. I was hoping to catch the early airline seat sales, but so much for waking up early eh? SM Mall of Asia’s SMX Convention Center was already starting to fill up as we bought our tickets (PHP50.00) and dropped our stub for the raffle. I’m not sure what the prizes were, but I sure hope we win. Finally, we were inside, scrambling to find the airline booths. After some confusing minutes, we found it on the left side of the floor. Cebu Pacific, Zest Air, Seair, AirPhil and Philippine Airlines were all huddled together and the queue was starting to get long (well, except for the PAL and Seair booths). I was hoping to get a cheap deal for a return trip to the land of the Ivatans, but no such luck. The cheapest fare Seair was offering to Batanes was at PHP6,000.00 one way. The tickets we got through their website last year was better at PHP7,000.00 for a two-way fare, so no deal. The story was almost the same with all the airlines. The lowest fare was at PHP499.00 (total cost with all the additional charge was at PHP900.00++) and it does not cover all local destinations. Disappointed, I just booked for the Cebu flight that I needed to arrange, I bit the bullet at the aforementioned price since I really didn’t have much choice as my travel date was almost at hand. The lines were long and it was moving at a snail’s pace. After almost an hour at the line, I finally got through. With that business done, it was time to check out the pavilions. 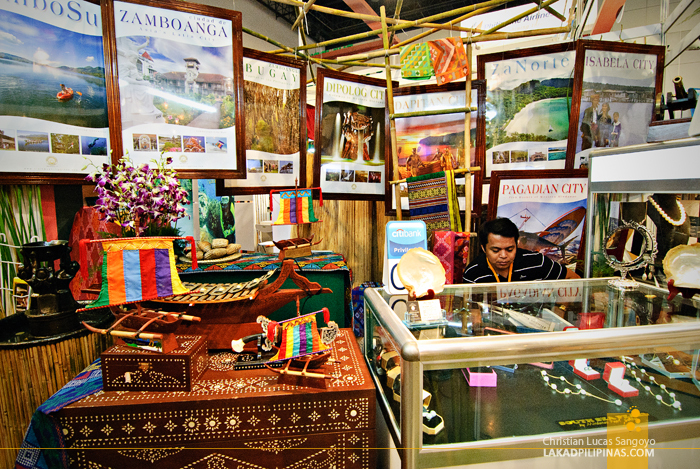 Since it was my first time to attend a Travel Mart, I was pleasantly surprised at the different region’s booths. 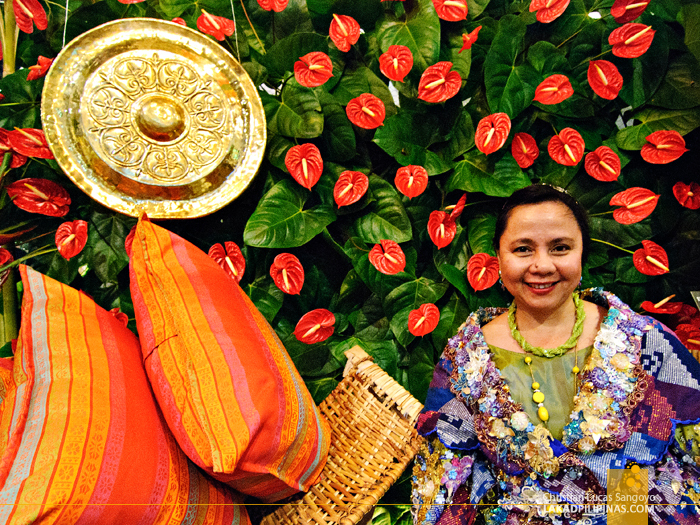 I specially love Davao’s which had a huge D A V A O spelled out on a wall made up of local fruits and vegetables. They were also serving cups of pomelo juice which were very popular with the visitors. 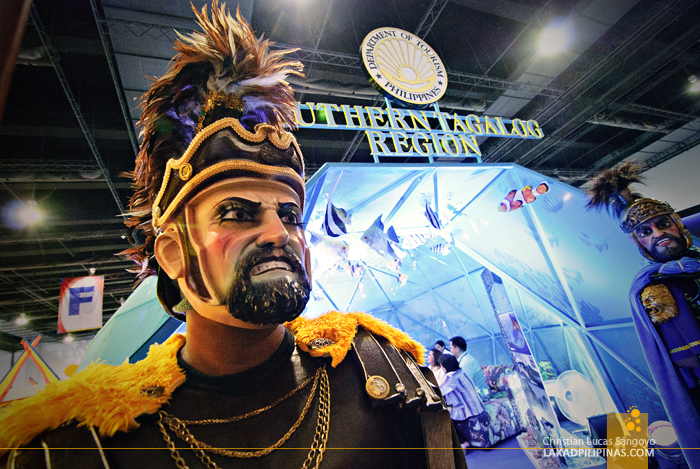 Some booths have local dance presentations, like those of Palawan’s and Banaue’s but the best pavilion in my opinion was that of Southern Tagalog which was covered with a dome and guarded by two Centurions of the Moriones Festival. 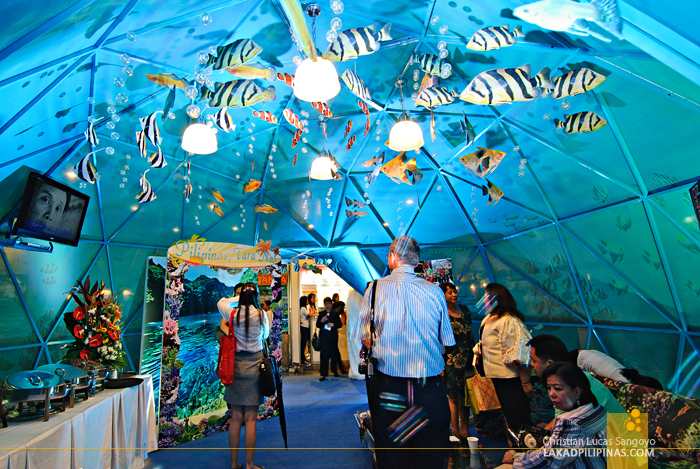 Inside the dome, the atmosphere was a glowing blue with fishes swimming overhead simulating the underwater paradise of its locales. 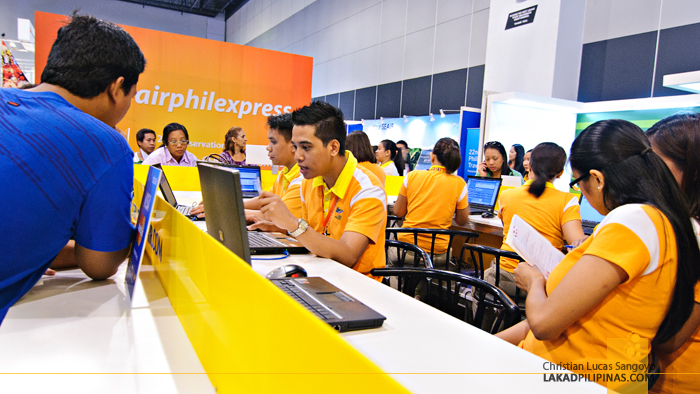 There were also the expected travel tour booths, hotels and accommodations at discounted prices. I was totally euphoric to actually book a room at Dumaluan Beach Resort in Panglao at a discounted price (and they even upgraded my reservation just because I’m their first customer). I’ve been calling up resorts in Bohol left and right this past few days and can’t seem to get an affordable room and I finally got one here, of all places. Travel literature was also all over the place, magazines were on sale (I bought an issue of the Lonely Planet for Php150.00 and copies of 7,107 Islands Magazines at 2 for Php75.00) and there are loads of free ones too. Maps and brochures were also in abundance, totally free of charge too. You bet I left the hall with more than a handful. There was an ongoing program at the center stage, a cultural dance competition, as we made our way through the maze of booths. The stage area, however, was much too crowded and all that hours of walking and waiting in line made our stomachs grumble so we chose to find the exit sign instead. My first Travel Mart experience started out slow but eventually did go very well. 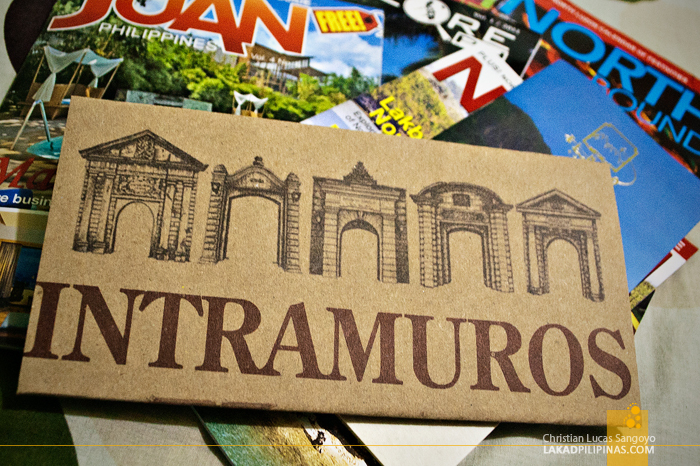 I ended up with a plane ticket that was more affordable than the current web prices, got to book a room in Panglao at a cheaper rate, and got to bring home tons of magazines, maps and brochures. And although my dream of going back to Batanes was not to be, my fifty-peso entrance fee was very well worth it. By the way, I asked Seair if the prices of their tickets would still be the same on the second day and they said that it depends if all the current rates would be sold out within the day; there’s still a chance of a cheaper flight to Batanes it seems. I also overheard that Cebu Pacific would open all the local destination tomorrow on sale. So with that, good luck to all travel bargain hunters! hangmahal naman ng tiket to Batanes, gusto ko rin dun ei. kelan kaya uulitin ng SEAIR ang seatsale promo nila before??? Pricey pa rin nga tickets to Batanes. I haven't attended this :( Booths look awesome, and can encourage anyone to pack his/her bags! nice. ito pala yung sinasabi ni Chyng kanina. Akala ko talaga event siya na mga invited lang ang pwede. Problem lang uber dami nga daw ng tao. Great deals. At least may nangyari sa pagpila pila mo diba? hehehe! Hope readers be forewarned of this. i was there previously. wasn't happy and didn't score any cheapo deal. i got no patience w super long queue. i realized it's much easier to avail deals over internet. but yep booths by regions were amusing thu'. wow i missed this sayang. P6k for one-way to batanes?! expensive talaga to go there, huh. I believe one needs to have at least P10k and it was 3 years ago pa. I wonder how much this time. Nagpunta kami ng mom ko sa travel mart last Saturday. Excited pa naman ako sa promos sa Batanes kaso medyo mahal pa rin. :( Ang nakuha lang namin ay Corregidor deal sa Sun Cruise. 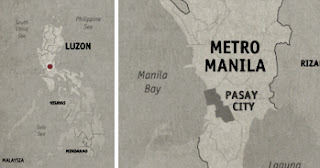 Konti lang ang discount pero matagal na namin gusto mag Corregidor kaya bumili na lang kami. 1,500 day trip and Manila Bay Cruise yung promo. Mas mura ang Pakyaw promo dati. Haha oo nga, tagal ng pila ah! Yup, same sentiments here. Mahal pa rin! Yup! Kaya lang konti lang yung super mura talaga na deals..
Swerte mo naman! How much mo nakuha yung sa Batanes? Apartments in Singapore - Treetops, your favorite holiday apartments in Singapore. Enjoy 5 star comfort in lush greenery at Treetops with your family and friends.